This series' goal is simple. We aim to ask one uncomplicated but often neglected question. Jews living in Islamic lands had for centuries lived their lives according to the dictates of Torah. G-d fearing and faithful, the overwhelming majority of them observant of Torah and mitzvos. How is it that, upon encountering their supposed defenders (Reformists, Zionists, etc), those champions of progress and enlightenment, these once great communities suddenly began an uncontrollable downward spiral? How could it be that till then, despite all the hardships that sometimes entailed their daily lives for two thousand years, they excelled in the worship of G-d? In 1985 the New York Times had a three-part series detailing the difficulties that Sephardim encountered upon arrival in the “Jewish State”. The abuses, the discrimination, the wholesale abandonment of faith that a generation before would have been unheard of. History cannot be as clear cut as the Old Historians of “Israel” would have us believe. What happened? Whitewashing the muddied slate of history is a favorite Zionist pastime, but the road they tread on was paved long ago. Long before David Ben-Gurion started spinning his yarns and labeling it history, there was the Alliance Israélite Universelle. Founded in 1860 by French-Jewish statesman Adolphe Crémieux, the Alliance set itself up as the vanguard of civil rights activists for Jews the world over. One problem, however. No one had ever asked them to fulfill this role. Luckily, that never seems to stop someone bent on doing cultural makeovers. Shrieking night and day over actual, perceived and imagined injustices, they made it their mission to improve the condition of “the Jew” wherever he may be. What did “improvement” entail? French culture of course! Sans a shred of Judaism. “Improvement” is a very subjective term. This burning desire to enhance the standing of Jews led the Alliance to engage in a campaign which was, by their own admission, a textbook case of mission civilisatrice (a civilizing mission) amongst Jews in Morocco, Tunisia and Iraq, to name a few. The fact that Jews living in Arab countries had a culture spanning thousands of years brimming with art, literature, music and scholarship seemed to have escaped the keen eye of the Alliance. The inhabitants themselves seemed hopelessly unaware of how primitive their lifestyle and beliefs were and they had to be drawn out of the darkness to a G-dless light. By hook or by crook. Progress could not and should not be held back by the likes of these pious Jews, who had the audacity to continue in the ways of their forefathers, living peacefully amongst their neighbors, seeking to serve G-d in purity. What nerve! Thus the Alliance’s savior complex was neatly repackaged as cultural heroism. They were saving these poor lost souls and if there needed to be a little heavy-handedness, so be it. The Alliance opened their first school in Tetouan, Morocco in 1862, but there had been machinations decades before, starting in Algeria in 1830, when France invaded and subsequently colonized Algeria. 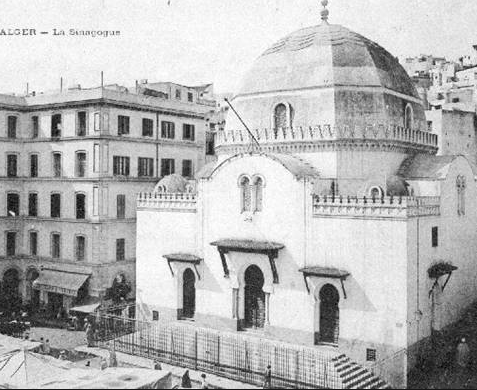 Once French control of Algeria was firmly established, liberal (read: anti-religious) Jewish intellectual circles such as the publication Archives Israelites (a forerunner of the Alliance) started clamoring for French government intervention in “civilizing” their coreligionists in Algeria. Their caterwauling produced fruit. By 1841 all batei dinim (rabbinical courts) where placed under French jurisdiction, linked to the Consistoire Central de Paris. By 1845 Reformist Jews from France were set up as rabbis, usurping the previous rabbinic leadership, over all Jewish communities in Algeria. The fact that their congregants didn’t want them or need them mattered little. Mission civilisatrice. The “rabbis’” mission? "To inculcate unconditional obedience to the laws, loyalty to France, and the obligation to defend it.” In short, to supplant a covenant with G-d, handed down generation to generation, for a mundane nationalism. The new “rabbinic” leadership’s purpose was tragically ironic. To replace G-d with country. To remove the spiritual from communal and private life. The nation-state would now be their center of worship, as it was for them (the Alliance). Nationalism and “civilization” for Torah and Truth.